The Space Needle is a tower in Seattle, Washington, and is a major landmark of the Pacific Northwest region of the United States and a symbol of Seattle. 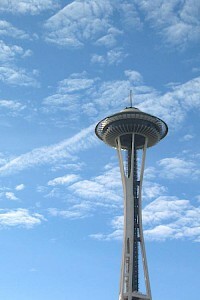 Located at the Seattle Center, it was built for the 1962 World's Fair, during which time nearly 20,000 people a day used the elevators, with over 2.3 million visitors in all for the World Fair. The Space Needle is 605 feet (184 m) high at its highest point and 138 feet (42 m) wide at its widest point and weighs 9,550 tons.